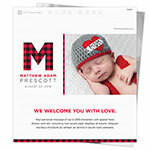 A bold initial in buffalo plaid accents the large photo on this modern and very on-trend birth annoucement chocolate bar favour. Design: Large photo with buffalo plaid monogram and accents. Personalization: Front photo, monogram, name and back message. Recommended Photo Size: 929 W x 769 H pixels.